The Thin White Duke, indeed. In fact cocaine is one of the more important characters in the book, David’s constant companion throughout the mid-70s, a key contributor to the making of Diamond Dogs, Young Americans, and Station to Station, just for starters. I was surprised to find that it didn’t get its own entry in the index, although there are 21 entries under “Bowie, David, cocaine addiction of”—not to mention 11 more under “drug-induced paranoia and psychosis of,” which is itself reason enough to think twice about trying the David Bowie Diet. I myself have always been terrified of cocaine, in part because of what it did to David Bowie while helping him make some of the greatest music ever recorded. They actually make Bowie coke mirrors. I bought one on eBay UK. But since I don’t do coke anymore, I gave it to a girlfriend as a gift. She uses it as a compact. Although there’s no way to measure this in any forensic sense, it’s wholly possible that David Bowie did more cocaine in the mid-1970s than anyone else in popular culture: the Eagles, Elton John, the Stones, Rick James, Oliver Stone, Hollywood Henderson or Julie Your Cruise Director. By 1973, cocaine, long a recreational substance and status symbol with an extensive history of glamour, was so firmly entrenched in the culture that President Nixon declared war on the cocaine cowboys importing it from Colombian killing fields in private planes and disseminating it throughout the cities and suburbs until coke abuse took on the properties of a biological epidemic. Disco swingers wore “Coke Adds Life” pendants, and 18-karat gold spoons against their hairy chest or perfumed cleavage. Consumption was often done in restaurants and bars with the same élan one would use to sample from the wine list. As late as 1974, many people weren’t convinced it was at all addictive. “So much publicity has gone out on heroin that people don’t want to get started on it,” Irwin Swank of Chicago’s Bureau of Narcotics is quoted as saying in a Newsweek cover story on the cocaine craze. “But you get a good high with coke and you don’t get hooked.” Mr. Swank, clearly a glass half full kind of Narco. While planning the follow-up to Young Americans, Bowie would sit in the house with a pile of high-quality cocaine atop the glass coffee table, a sketch pad and a stack of books. Psychic Self-Defense by Dion Fortune was his favorite. Its author describes the book as a “safeguard for protecting yourself against paranormal malevolence.” Psychic Self-Defense‘s instructions (“Sever all connections with suspected originators”) seem like a paradigm for the isolated and suspicious mode in which Bowie conducted himself during this period, except, of course, for one of Fortune’s key tenets: “Keep away from drugs.” Using this and more arcane books on witchcraft, white magic and its malevolent counterpart, black magic, as rough guides to his own rapidly fragmenting psyche, Bowie began drawing protective pentagrams on every surface. Well, yes…when Keith Richards thinks you’re overdoing it on the drugs, it may be time to get some help. This entry was posted	on Monday, April 5th, 2010 at 5:01 pm	and is filed under Because he's David Bowie, that's why. You can follow any responses to this entry through the RSS 2.0 feed. You can leave a response, or trackback from your own site. So that was David’s diet. While David’s diet does not seem quite as nourishing as Thompson’s, he is alive while the good doctor went bye-bye … no conclusion I can draw from this. Like I am not half a dozen books behind already and now I have to read Bowie. At your suggestion I read Bill Graham’s bio about 2 years ago and really enjoyed it. I wonder if this is the meaning behind “Always Crashing in the Same Car”? 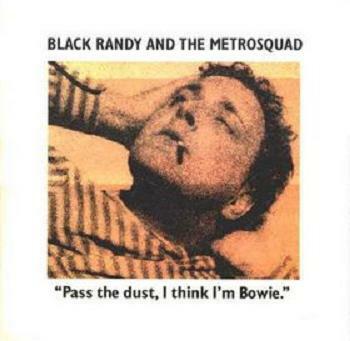 I once had that Black Randy album. Can you believe it? However, I always thought BR was referring to angel dust . . . one of my personal favorites. Thank you for this great stuff! Next up: Bing and David. “Consider this: It’s Monday, probably, and if there’s a greasy pipe to be slithered down, David Bowie has slithered down it. He is, by his own admission, lucky to be alive, having come so close to exploding in a coke-fuelled supernova during his recent yearlong stay in Los Angeles. Since then he has relocated to Berlin, in the vain hope of ‘cleaning up,’ and now finds himself behind the wheel of an open-topped Mercedes Benz Ponton, cruising the city’s ripped backside with Iggy Pop, once of the Stooges, in the backseat. “This unlikely double-act has been joined at the hip since the start of the year, united by a desire to curb their prodigious chemical appetites and uncertainty about how on Earth to go about it. Some days are better than others. ‘There’s seven days in a week,’ Iggy would later recall: two for bingeing, two for recovery, and three more for ‘any other activity.’ Sometimes that meant painting, reading, or visiting art galleries; sometimes drinking the night away in dimly lit sidestreet clubs, watching women dressed as men dressed as women sing ancient songs of love, loss, and war. On other occasions it meant pulling the top down and putting your foot to the floor, doing laps of the city in search of something better to do. “That, in fact, is what these dum dum boys are up to tonight: riding and riding, in Iggy’s words, or ‘going round and round’ in Bowie’s. Pulling into the Kurfürstendamm, one of the main arteries of West Berlin’s zigzagging network of roads, they spot someone they know, parked by the side of the road — not a friend, mind you, but a drug dealer, whom Bowie is pretty sure has pulled a fast one on them. What can we do about this? he wonders. Stepping out of the car and resolving the situation in gentlemanly fashion isn’t an option. Someone, as he might later sing, could get killed. No, there’s only one thing for this, he thinks, as he rams the front grille of the Mercedes into the back of the dealer’s car — and then reverses, and does it again. The pictures indicate that there might be something wrong with the supposedly lowest weight of Bowie. Although very thin, it is almost impossible that a person about 1.80 m tall (?) at around 85 pounds looks that way. You could expect that a person with these data doesn’t look like a thin white duke, but like a skeleton or an anorexic prone to starvation (and they look very different – you can literally count the ribs, arms and chest are far skinnier – and this is an absolutely life-threatening stage). 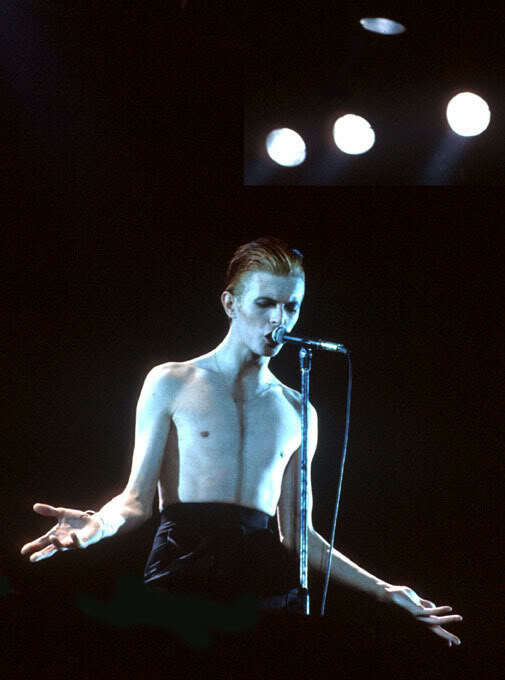 And of course with such a starved body you are simply incapable of doing any performance on stage like Bowie did in the 70s. Maybe he was a little smaller than claimed in contemporary media, maybe around 1.70/1.75 m? Maybe the lowest weight was still above 50 pounds? I know numerous anorexic patients, and some 30 years ago I was anorexic myself. And I still own photographs of me taken at that time (at hospital, it was considered acutely life-threatening). I know what height and weight I had in the 80s. So if there are ways to verify if the often-repeated claims are really true (which I doubt), I would be glad if someone could mention them. And, not to forget, I like his work very much. It helped me recover from my own eating disorder and to pursue a , as far as that may be possible – some residues are still there – 30 years later.